Cable TV has become expensive. If you have two televisions you need two cable boxes. Renting those will cost you upwards of $25 a month bundled in a package. Add in a modest cable channel package and tax, and you’re looking at a minimum of $100 a month, or $1200 a year. Is it worth it? That depends on how much of your monthly disposable income you want to spend on this form of entertainment. And I consuming less media than before? No, though my viewing habits have changed since I’ve entered middle-age. One important point in my viewing habits has changed. Live TV is no longer important to me. I can watch news and entertainment on my schedule. Sure there are breaking news or a few other events I still will watch live, but you don’t need cable for that anymore. Am I still spending money on consuming “TV” programming? Yes, but on my terms, not at the whim of some cable company in some bundle I have little control over. I pay for Netflix, it’s inexpensive and provides access to reasonable entertainment for the price. I like sports as well, so I subscribe to services like MLB TV, Sportsnet World Now and NHL TV. All of these are available on my computer, tablet, smartphone and through my Apple TV. Speaking of Apple TV, for the price it’s good value. Some of the useful apps include CBC News, NASA TV, Bloomberg TV, CBS News, ABC News, PBS, Ted and YouTube to name a few. YouTube in particular is useful if you want to watch live events including news. Al Jazeera (HD), CCTV, DD News, Channels, France 24, Sky News, RT, TV Nigeria and others provide you with live regional and global news. And for now, even CNN is available through YouTube if you’re willing to watch the pirated signal. 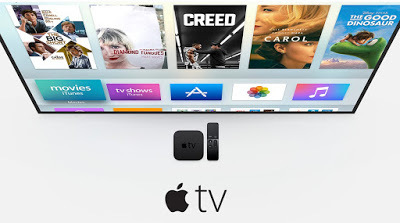 Unfortunately there are few Canadian “TV” apps for the Apple TV. CBC News has a modest one and there’s the National Film Board. CTV and Global are missing in action, for now. Eventually I see them coming to platforms like Apple TV. I’m now spending an average of $50 a month for “TV”, half of what I was paying before and watching shows on my schedule. I’ve joined the millennials who are characterized as “cord-nevers”. I’ll never go back to cable. 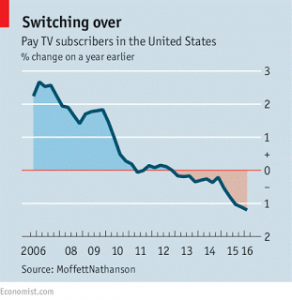 Related: Cutting the cord, The Economist, July 16, 2016.